For many artists it isn’t, but there are those that are seeing considerable traction from it right now. This was first brought to my attention by Juno-award winning Helen Austin, a recent interviewee of mine (podcast episode is here). She mentioned that one of her songs was featured in a curated Spotify playlist, and wondered aloud whether or not she could engineer this type of success in the future. Now, let’s keep in mind – someone who has as many placements as Helen wouldn’t be bringing up such matters if it wasn’t profitable for her. I’m going to digress for just a moment, but I swear what I’m about to share is related to the topic at hand. As you may know, I was recently approached with the idea of guest blogging for JTV Digital – a project I have chosen to take on. I asked Jeremie what types of posts he wanted me to create for the blog, and he sent me a bunch of different ideas. 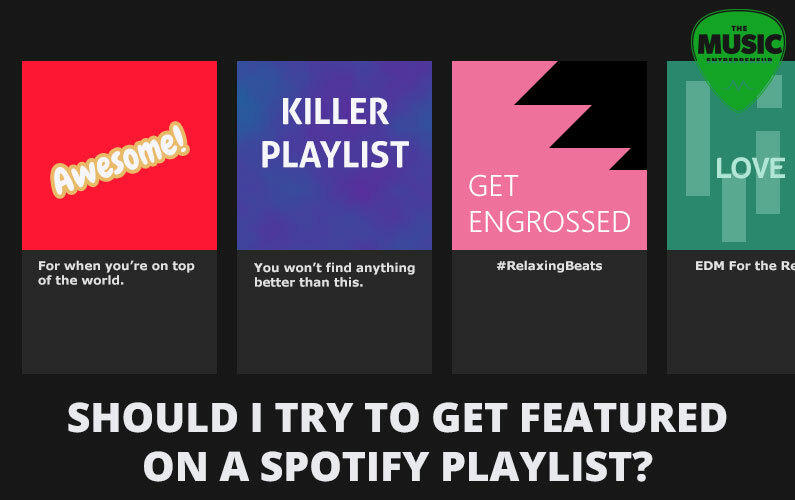 One idea revolved around Spotify playlists. He also sent me this post from the DIY Musician Blog as reference. It tells of how Perrin Lamb got featured on a Spotify playlist out of the blue, and now has a song with more than 10,000,000 plays on Spotify, not to mention increased play count on other songs in his catalog. Oh, and by the way, my post about getting featured on a Spotify playlist just went live today. Check it out here: How to Get Featured on a Spotify Playlist. So, is it worth getting picked up? Yes, but only if you have the time to pursue it. If your music career bandwidth is already stretched, you may want to think twice about adding more to your plate. Most of this seems pretty obvious to me, and I’ve even discussed many of these tips in my book. But I’m happy to share with you what I’ve been learning, and would also love to hear about your successes on Spotify or with streaming in general (leave a comment below). Identify tastemakers and influencers. Find out who’s making these playlists. Craft an awesome online presence. You’ll increase your chances of making a great impression with list creators. Reach out and connect with influencers. Be quick, be respectful, be upfront about what you’re trying to achieve. Practice professionalism. Contact people in the manner requested, and always be thinking about how you can add value to them. Follow up. People get busy and they forget things. Don’t give up – follow up! Promote. Once you’re on a playlist, do everything in your power to promote it to get more plays. Make your own playlists. There’s nothing saying you can’t make your own. You may not have the marketing power major labels or agencies do, but that doesn’t mean you can’t rise from the groundswell. Will you be putting in the work necessary to get noticed by tastemakers?